All I have to say about this recipe is: Don’t knock it ’til you’ve tried it. I completely understand if you read the name of this recipe and your initial reaction was to make a face of disgust. I’m with ya. I don’t like sauerkraut. I don’t like the way it smells. I don’t like the way it tastes. I don’t even like the way it looks. But I promise you, this dip tastes so good that you really might just pass out from the delicious flavor. 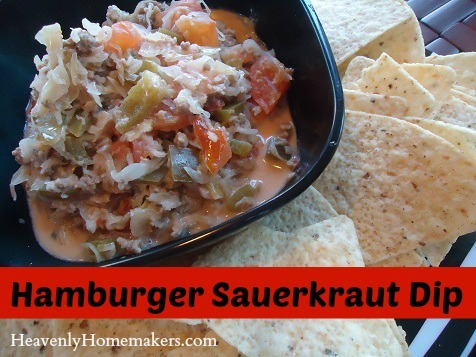 It doesn’t taste like sauerkraut at all – but instead is a wonderful mix of flavor that is completely addicting. The first time I tried it, I stuffed myself so full, I could barely walk out of the kitchen. It was not cute. I got the recipe from my friend Jen, who, for the record, does not like to cook. That may tell you something about how easy this dip is to put together. We prepped all the ingredients together one evening, then I threw everything into my crock pot the next morning for us to chow on that night. And did I mention that I stuffed myself? Seriously, whether you like sauerkraut or not, you must try this dip. Brown ground beef until thoroughly cooked. 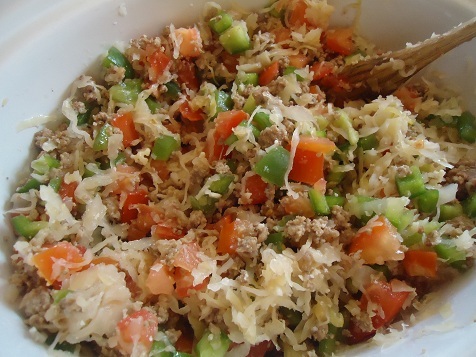 Stir browned meat, chopped tomatoes and peppers, sauerkraut, and sour cream into a crock pot. Cook on low for 5-8 hours. Stir occasionally. Sneak bites often. Try not to eat the entire pot. Good luck. I’m very happy to point out the fact that I have posted all kinds of different cheese dip recipes on this site, so you must surely be very impressed that I have climbed out of my cheese dip lovin’ box to post a dip that is significantly different and exciting. See, here they are: Healthier Cheese Dip; Super Simple Chip Dip; Cream Cheese Salsa Dip; Hamburger Cream Cheese Dip. And here I am posting a dip recipe that does not include cheese – but sauerkraut. How about that? Lacto-fermented sauerkraut is delicious! I’ve been making it for a few years now, and I could never go back to the vinegary stuff sold in the stores. I think if you do not like the canned, jarred store-bought stuff, you might just appreciate the lacto-fermented kind. I agree with Lisa. The store stuff is so disgusting. We put over a hundred punds of cabbage into sauerkraut this year because we eat so much of it! It’s health benefits are incredible! I can’t wait to try this dip…it sounds so wonderful! Thanks! Yes – what a great way to use some fermented kraut I have fromt this summer! Would love some links to some good lacto-fermented recipes! Lisa H. says it well. I can only add that we made our first lacto-fermented sauerkraut last year, it’s good, and it’s easy. I love saurkraut. My husband and 1/2 of the kids love it, too. Especially when cooked in a bit of brown sugar! I LOVE saurkraut!!! This dip looks absolutely delicious!!! Do you serve this with tortilla chips? Love sauerkaraut! Can’t wait to try it! Love Sauerkraut…will eat it straight from the can and on reuben sandwiches. YUM! We love sauerkraut. Having some German descent I grew up eating it quite a bit. In fact cabbage rolls with sauerkraut are on the menuplan tonight. This dip sounds good. I’m part German so all I had to see was the word sauerkraut and I was hooked!!!! This looks REALLY good!!! This is perfect for one of those lazy Saturdays or Sundays. 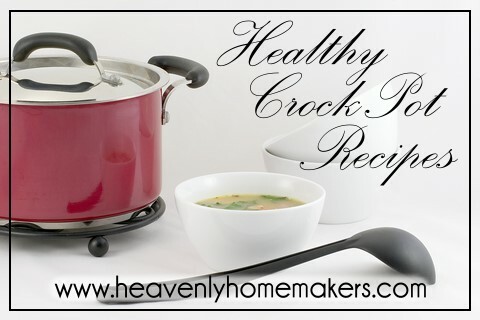 Just mix it up and keep it warm in the crock pot and snack on it all day!!!! YUM YUM!!!!! Lazy pierogies could be done in that crockpot of yours too. Use sauteed onion with ground beef or turkey, sauerkraut and noodles. You can add some butter too. Mix it all up and enjoy. You can use fresh cabbage instead. Just make sure you sautee it with the onions and butter first. MMMM is it lunch time? Ok, I have to admit. My initial reaction was a face of disgust….but I decided to read on. I don’t really like sauerkraut, except on a Reuban sandwich. After reading what you wrote, I’m actually drooling and would be interested in trying it. I even though maybe some cheese mixed it might make it extra tasty, hehehe. And I’m very interested in the lacto-fermented sauerkraut other posters mentioned above, so I may have to look into that as well. Thanks for sharing another delicious sounding recipe. Sauerkraut does not top my list of favorite foods. Doesn’t even come close (well, closer to the top of foods to feed my worst enemy!) But this recipe has me intrigued. Christa’s comment about using fresh cabbage in her recipe sounds doable. Over the past few years I have gone from non-cabbage eater, to putting it in soups, salads, (still don’t like slaw), and maybe now dip? Laura, you haven’t steered us wrong yet in good recipes, so I’ll have to give this a try. Just wanted to check if you put the juice in with the sauerkraut or if you drain it first. We make our own as well and have a bunch to use. I love easy, snacky dinners! Yes, thank you so much for mentioning that! I will edit the post to include those directions! I was wondering if canned tomatoes would work or is that too much juice? Sounds yummy! We love sauerkraut. 100% Pa. Dutch. does that answer your question? pork and sauerkraut is the traditional new year’s day meal. put it on top of hot dogs. serve it as a side dsh. lots of nutricious goodness. mom always put a bay leaf on top when cooking – not sure why. Laura, should we drain the ground beef? My mom was telling me about a skillet dinner similar to this, and I think she called it “crack” dip. I don’t love the slang…but maybe that’s a better description of how much you want to eat this dip? Laura, I love ya, girl! But this is one recipe we’ll have to pass on… Wish I could say otherwise, but there isn’t a single person in our family who would eat it! Bubbies is the best you can buy in the stores. Oh… I am NOT a fan of sauerkraut (pickling anything is not a favorite), but I DO love the combination of beef and cabbage, so I might like this dip. Wonder if it would be just as good with regular cooked cabbage, instead of sauerkraut??? We just had this dip for the first time for supper this evening. When I first read the recipe, I was a bit skeptical but took on your challenge to try it. While purchasing the ingredients, I was asking my husband if he thought it would make enough to feed the five of us and he said he thought it would be plenty. I was also worried about what to do if none of us liked it as it was the only thing I was serving for dinner. I figured we would still try it and that if there wasn’t enough we could get a sandwich or something and the same for anyone who didn’t end up liking it. This dish was super easy to prepare. It smelled amazing while it was cooking. And your warnings of being careful while taste testing it were spot on. It was extremely difficult to keep from going back to the pot and tasting again! Even my husband had trouble stopping himself from tasting it. We served it with scoop tortilla chips. We had bought the family size bag. My husband made some onion dip so we could have some of that just in case we didn’t like the other dip. We would at least have that to eat with our chips. My family consists of 4-adults and 1-teenager. We enjoyed this dip so much that we wiped out that whole bag of chips and both dips!! (this dip tastes very good with onion dip on top of each scoop of the sauerkraut dip. Like you, we were stuffed when we were finished eating! Yes, it was that good!! This sounds wonderful. I’m wondering if I could serve this on a sub roll or in a tortilla as a sandwich. While I woul do dip for a meal, the rest of my family would not. But sandwiches I can get away with on occation. Any thoughts? I haven’t tried it. I would love to hear how it turns out! I too was skeptical of doing the dip thing for a meal but there really was no need to worry. The family was fine with it. We quite often have loaded nachos for a meal and this is the same kind of thing except you load up eat chip before you eat it. We tasted this dip on saltine crackers, while waiting for it to finish cooking and it was good. It might be a bit juicy for the sub roll or tortilla. Sogginess is not very appetizing to us. The taste would probably be fine. Just my thoughts, hope this helps. Thanks for the thoughts. I wish my family would do nachos or dips for dinner, but no way. Thanks for your thoughts. I may toast the sub rolls and drain the mixture a bit. We are going to give this a try tomorrow. So hope it works. Made this for our sharing group, and it was a big hit! We all really enjoyed it!